Air conditioners work best in enclosed spaces. The same is true for portable air conditioning. Keep room doors closed or use the a/c in an area where you can close off open spaces. 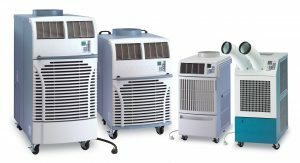 A common cause for poor cooling is when a portable unit is trying to cool an area larger than its rating. It is more efficient and provides more effective cooling when an air conditioner cools an empty room. When there are people in the room, the a/c does not need to work so hard to maintain the temperature. Also, try and start the unit when the temperature is low, like early morning or early evening. Unless you are using a rental portable air conditioner, you will need to keep them clean. Proper maintenance for any air conditioner is important. With a regular cleaning schedule, you will get better energy efficiency and faster cooling. Try to minimize the number of heat sources. When you reduce the number of heat sources, the room will stay cooler for longer and use less electricity. Powerful bulbs, large screens, and open flames are all examples of heat sources. Article by MovinCool.com. The next time you have an event, use a rental portable air conditioner and cool areas you thought were impossible.